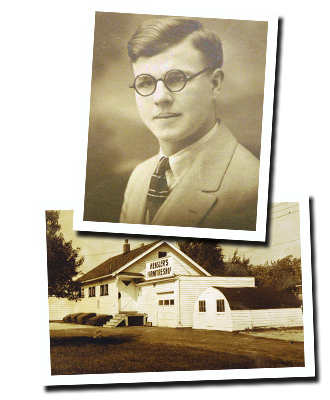 After being laid off by a local furniture maker in 1934, Alfred Hensler started Hensler Furniture Restoration in his parents' garage. It was a bold move to start a new business during the Great Depression, but through Alfred’s skill his business soon earned a reputation for quality work and allowed him to open a new and bigger shop on the corner of Ethel and Vera in Saginaw Township. With the continued growth in business because of their dedication to craftsmanship, Hensler’s outgrew their location at Ethel and Vera and moved to their current location at 3100 Christy Way in Saginaw Township in May of 1969. The new building, designed specifically for the operation and equipment required in furniture restoration, allows Hensler’s to handle their work more efficiently. Alfred’s son Jerry, along with grandsons Brian and Scott, and the staff at Hensler’s, continue the tradition of pride in craftsmanship and service that brings national recognition from home owners, businesses, moving companies, and furniture retailers. Hensler Furniture Restoration is a part of the Claims Prevention and Procedure Council, Michigan Chamber of Commerce, Michigan Retailers Association, NFIB, Restoration Center Hotline, Saginaw Township Business Association, and Saginaw Valley Antique Society.